As the PC Gaming scene ramps up (now that nVidia has finally released Kepler) we are starting to see some very nice accessories to take advantage of the flexibility and power that you get when you build a PC for the purpose of gaming. We have shown you more than a few items that are meant to improve your gaming experience including headsets, monitors, audio cards and now even mechanical keyboards. 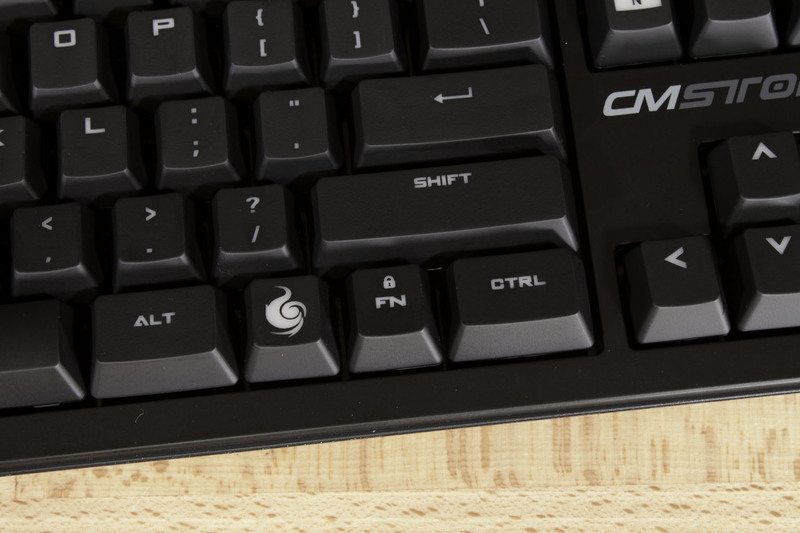 Only a few days ago we showed you Cooler Master’s new CM Storm QuickFire Rapid mechanical gaming keyboard and already have its big brother in the lab. So let’s take a look at the QuickFire Pro and see if this Cherry MX sporting partially backlit gaming keyboard has what it takes to earn the cool $100 that it will cost you. Like the QuickFire Rapid the QuickFire Pro comes in a slim keyboard style box (in other words flat and thin). On the front is a nice image of the QF Pro which shows off the limits of its backlighting (which we will cover in more detail later). You will also note that this device has a different version of the Cherry MX mechanical switch than what we saw on the Rapid. Before we had Cherry MX Blue switches which have a high resistance and a definite click to them. On the Pro Cooler Master has replaced these with Cherry MX Brown Mechanical Switches (we will talk more about these later too). Flipping the box over we find a fairly normal layout. You have the features listed in nine different languages along with a cluster of images to show off some of the Pro’s highlights. Once inside the box you will see that Cooler Master has done a very good job to make sure that your new purchase is protected in shipping. 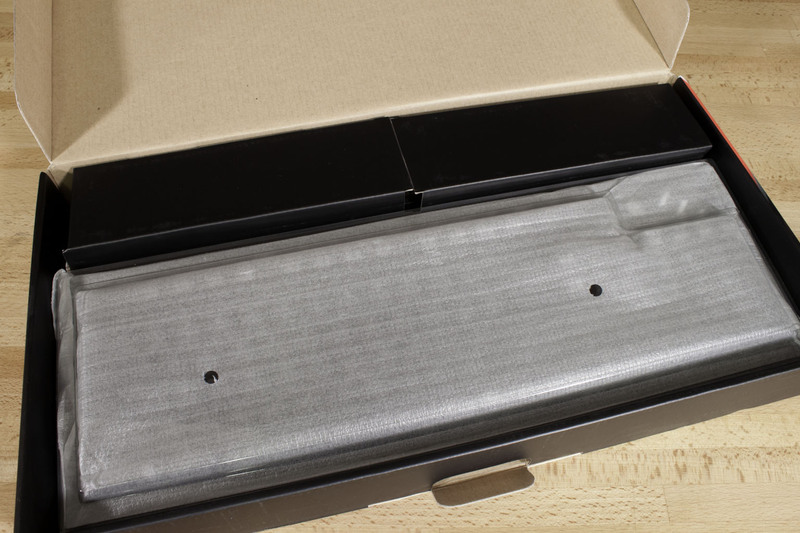 There is a plastic protective cover to prevent damage to the keys along underneath this the actual QuickFire Pro is wrapped in a thin foam cover (to prevent scratches). Once you get the QuickFire Pro out you will find the rest of the goodies; a manual, a cloth covered USB cable, and a key puller. Not much inside, but then again the real payoff is the QuickFire keyboard. The QuickFire Pro is built along the same lines as the QuickFire Rapid. 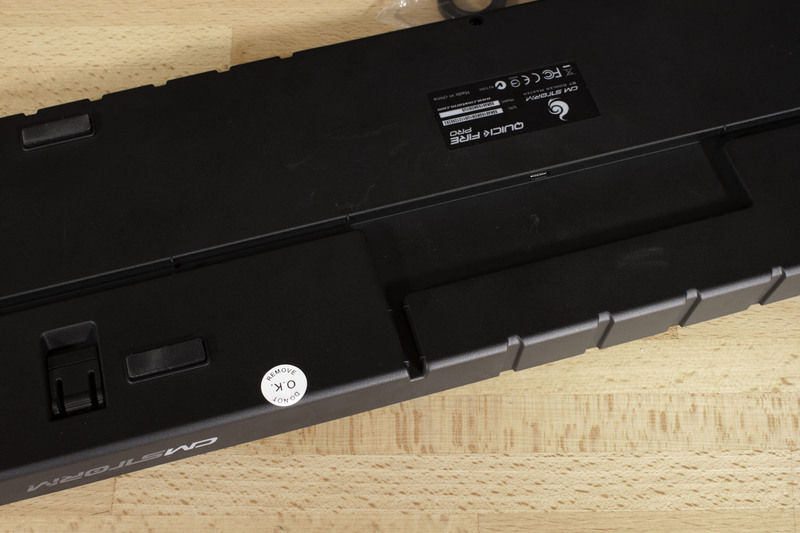 You get the same graduated look and feel along with the same weight (the QuickFire Pro actually weighs a little more). 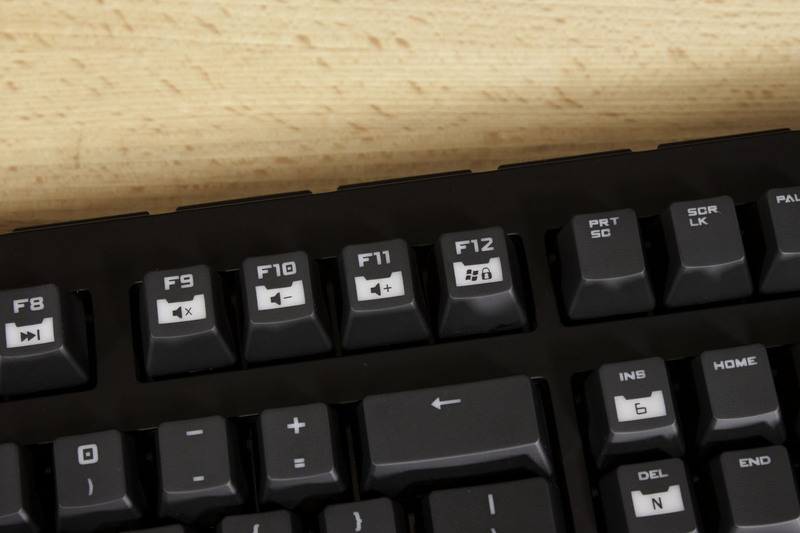 Cooler master has extended this keyboard to include all of the normal keys as well as the 10-key number pad. 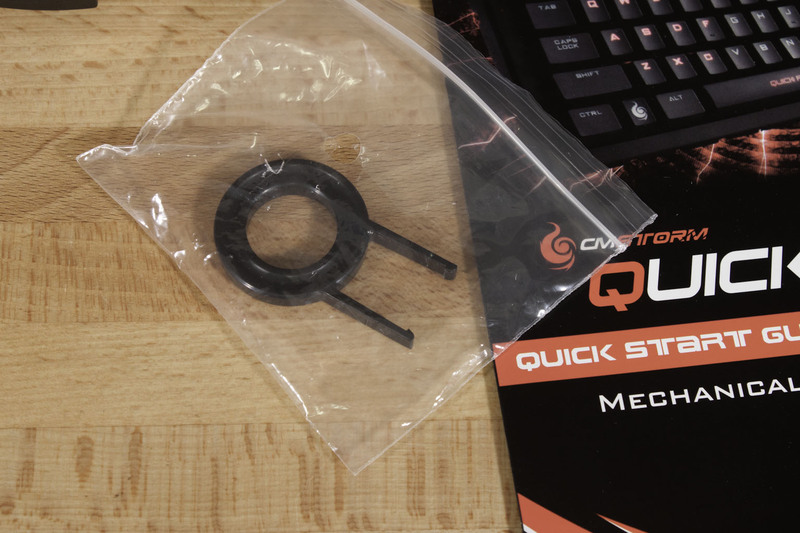 The QuickFire Pro also has the same sturdy rubber feet to keep it in place as well as very nice cable management along the bottom for the braided cable. Cooler Master has also put a coating on the keys and keyboard this coating is slightly rubberized to give a nice non-slip surface to it. You can feel the keys under your fingers, but there is no worry about slipping off. 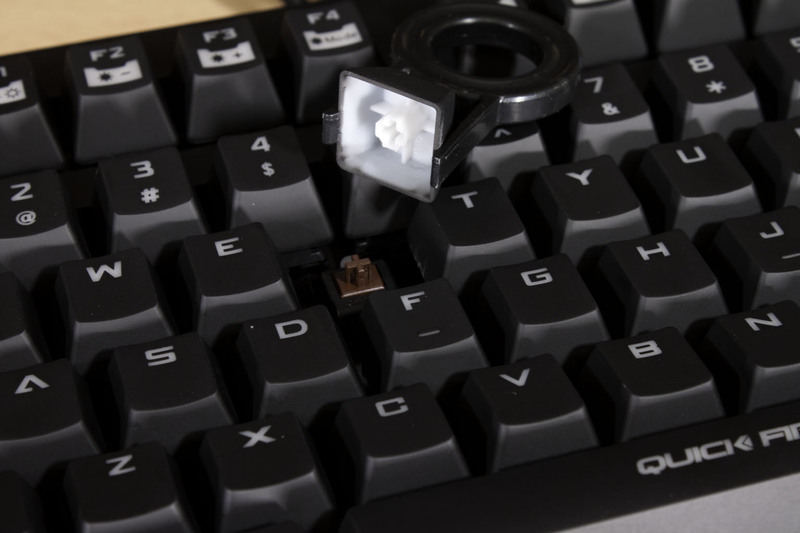 As we mentioned before the QuickFire Pro is using the Cherry MX Brown style switches. 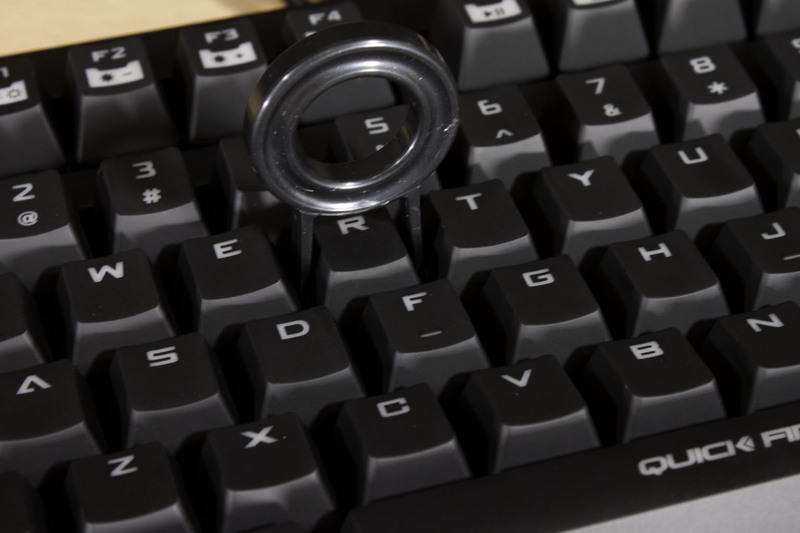 These are rated at over 50 Million (yes Million) keystrokes for durability. You can be sure that these will not go bad on you any time soon. Unlike the Cherry MX Blue Switches which were used in the Rapid the Cherry MX Brown switches have a little more resistance and also no audible click to them. There is a slight tactile bump at the bottom of travel but there is no audible click. As with the QuickFire Rapid you can also replace the keys on the Pro. There are no packages for this yet, but we hear they should be out soon. The QuickFire Pro also has partial backlighting to assist in gaming. There are four modes for this as you will see in our video. Realistically we feel that there are actually three modes as off is not really a backlight mode. There are also several levels of brightness for these to make sure they are set to what works best for you. 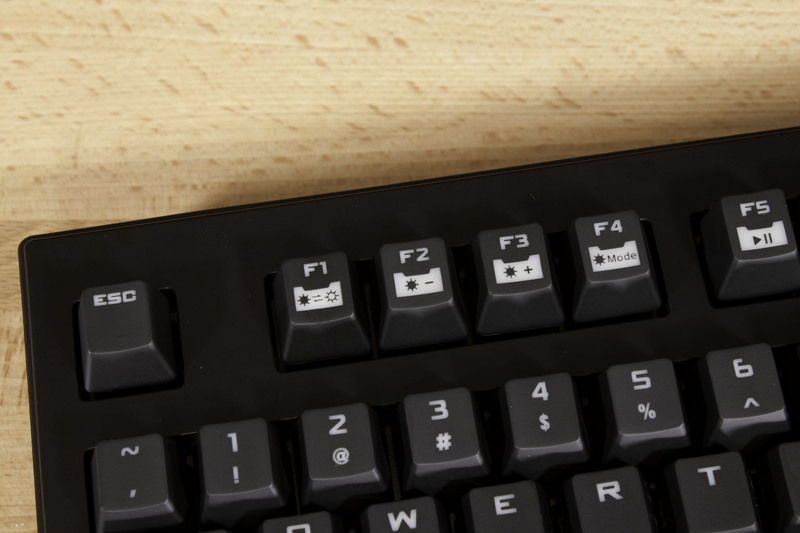 To activate this you will need to lock the Function keys as you will see in our video. 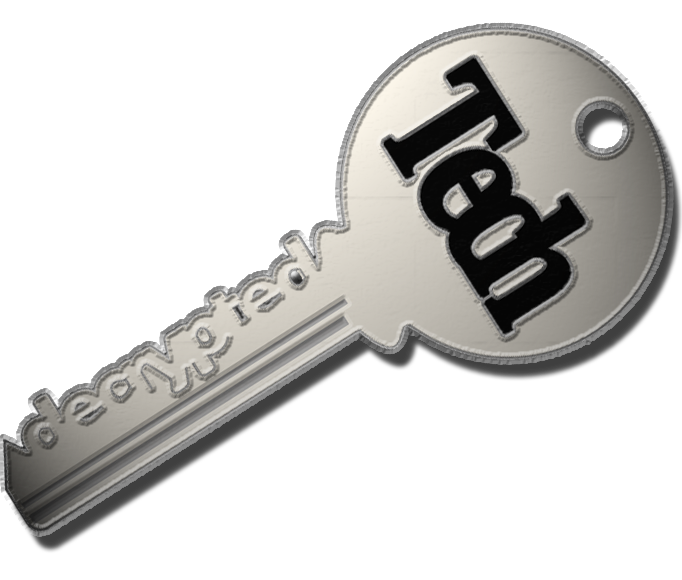 The same lock will also activate keys like the Windows Key Lock and the operation of the multimedia controls. The QuickFire Rapid also supports N-Key Rollover in USB mode so that you can press as many keys as you like at one time and not have the keyboard stop responding to the key presses. You can also set the level you want to run this at (either 6 or full N) to adjust for performance. 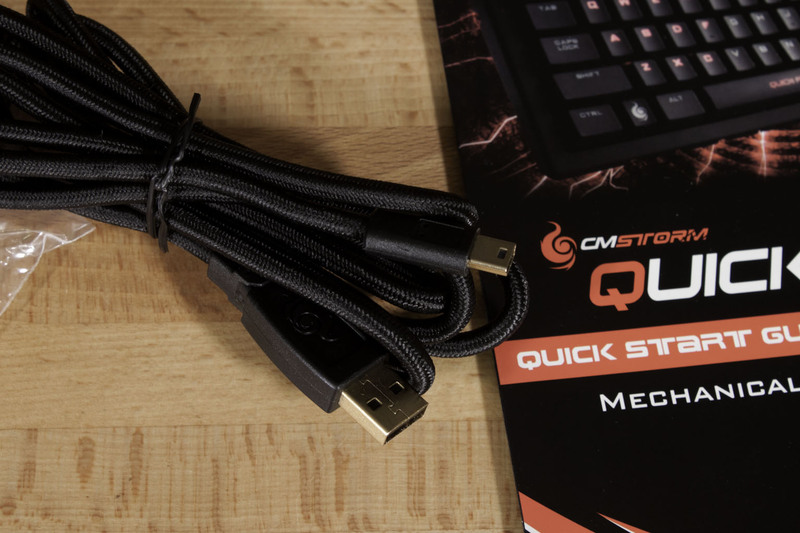 To help keep things organized and running smoothly to your computer, the QuickFire Pro also has a 1000MHz polling rate complete with a 1ms response time to inputs. 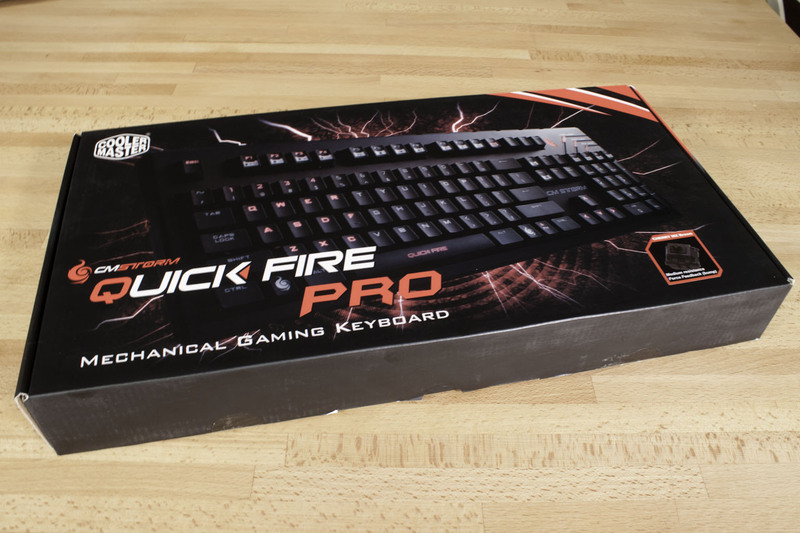 In all the QuickFire Pro is a very well built gaming keyboard. We hope that all of the hard work that Cooler Master has put into this will pay off under gaming stress. Value is another very subjective topic. What is expensive to some might be a deal to others. You can look at this topic in multiple ways. One is raw price and the other is what you get for the money. Each is accurate and both are correct ways to look at price/value. We tend to look at features, performance and real-property when we discuss value. However, we also take into account the raw cash cost of the item. Although the QuickFire Pro is a significant improvement over the QuickFire Rapid it is only going to cost you about $20 more. The retail price for it is only $99.99. For what you are getting we have to say that this is as very good price. 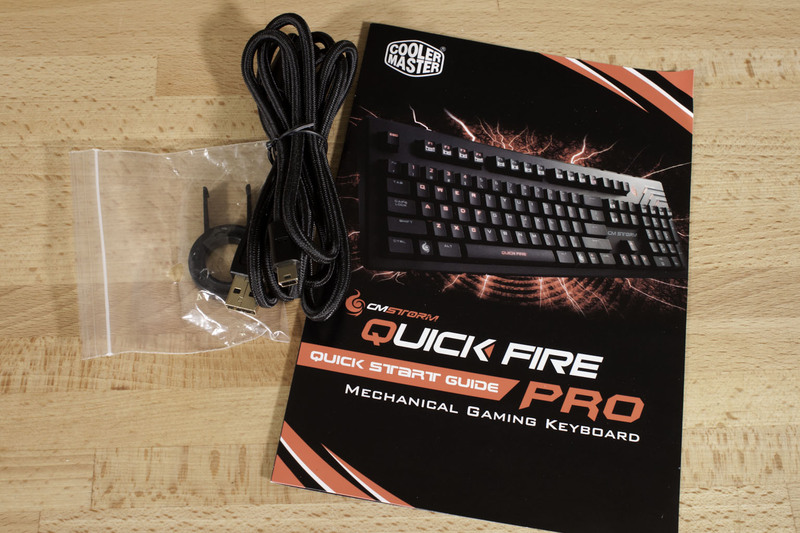 There are other keyboards in this price range that have do not have the same level of feature, functionality or quality that we are seeing from the QuickFire Pro. We liked the QuickFire Rapid when we tested it out. Of course there were things that we wanted to see on that keyboard. 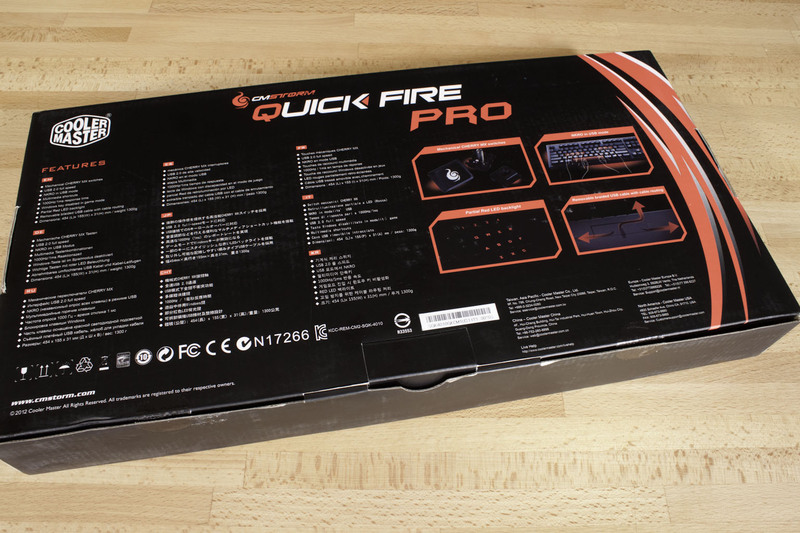 If we had of waited for a few days we would have found almost all of them in the QuickFire Pro. 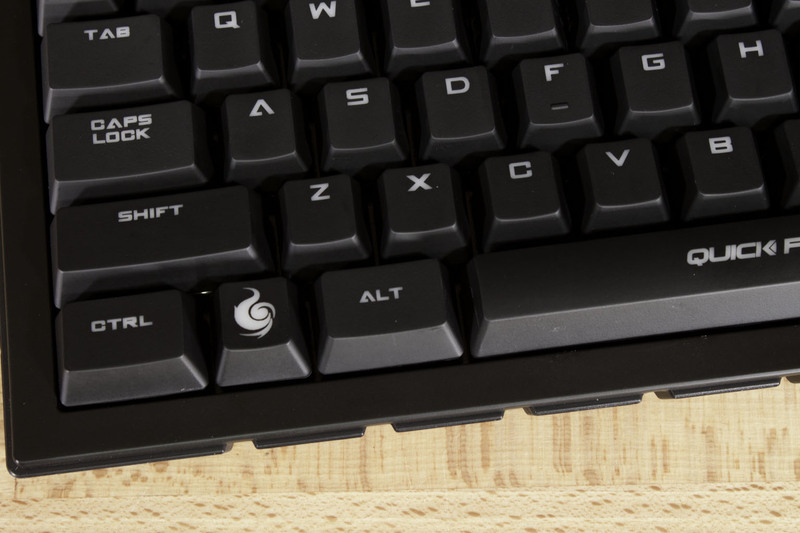 Here we have almost everything we could want in a keyboard for gaming. We have our gaming cluster backlit, the keyboard is stable enough and heavy enough that it won’t scoot around the desk, there is no worry about hitting keys out of order or hitting two keys at once, and so much more. We found that our movements in games like Dirt 3 and Hawx2 were cleaner (less jerky) while movement in our favorite first person shooters was considerably more controlled than with other keyboards we have used. Even the $100 price tag is not a turn off for the QuickFire Pro as it more than matches the price tag with features and quality. 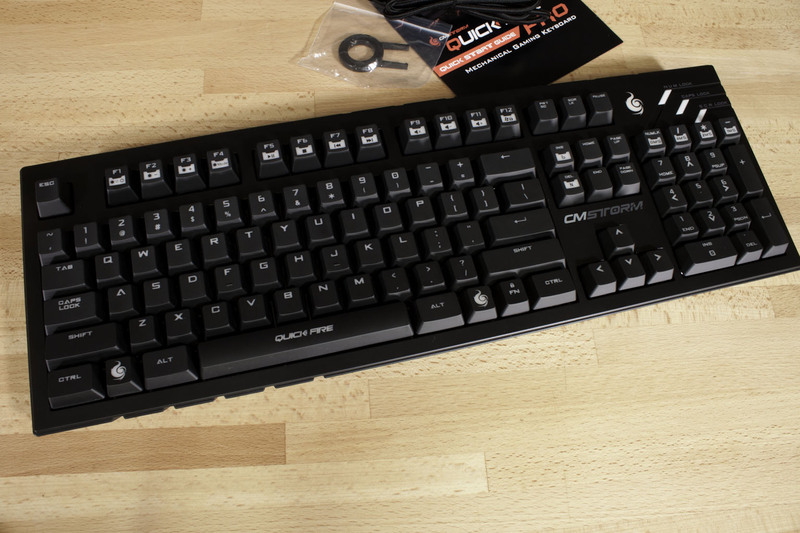 If you are looking for a solid gaming keyboard that comes complete with mechanical switches, replaceable keys, backlighting and more then you will surely want to pick up the CM Storm QuickFire Pro. With its combination of features, price and quality we are happy to award the CM Storm QuickFire Pro our Silver Key Award.